The potential here is extraordinary. 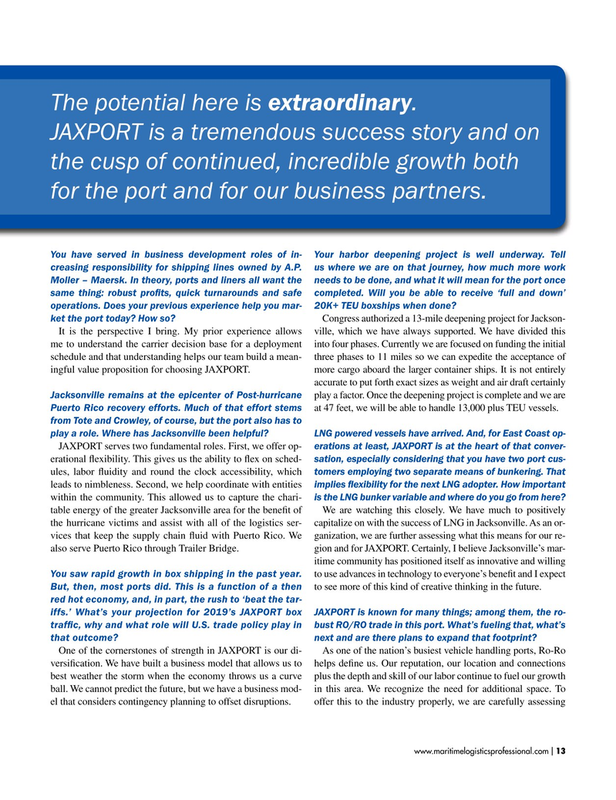 JAXPORT is a tremendous success story and on the cusp of continued, incredible growth both for the port and for our business partners. Moller – Maersk. In theory, ports and liners all want the needs to be done, and what it will mean for the port once same thing: robust profts, quick turnarounds and safe completed. Will you be able to receive ‘full and down’ operations. Does your previous experience help you mar- 20K+ TEU boxships when done? But, then, most ports did. This is a function of a then to see more of this kind of creative thinking in the future. red hot economy, and, in part, the rush to ‘beat the tar- iffs.’ What’s your projection for 2019’s JAXPORT box JAXPORT is known for many things; among them, the ro- traffc, why and what role will U.S. trade policy play in bust RO/RO trade in this port. What’s fueling that, what’s that outcome? next and are there plans to expand that footprint?